Have you noticed an increasing amount of commercial advertisements in Spanish on your browser? If so, you most probably installed Olacarita onto your computer. This adware application targets Spanish speaking users around the world. Its main goal is to generate financial revenue by redirecting you to pay-per-click websites. Such activity may result in specific computer security issues; hence, it is strongly recommended to remove Olacarita from the system before any of that happens. If you have any questions about how to terminate unwanted software, please leave us a comment below this description. Some users may be surprised to see Olacarita ads on their browser, especially if they employ extensions that block pop-ups. However, based on our security research, Olacarita can overwrite files of such extensions as AdBlockPlus, successfully making its way onto your screen. We can see that this adware application is highly intrusive, so even though it is not a computer virus or exceptionally dangerous threat, still we should not tolerate it. When a program tries to present itself as a reliable extension, it should be available for download on its official website. However, olacarita.com looks more like a hoax website rather than a real official homepage. It simply provides a concise piece of information on Olacarita, saying that this application will help you find the best shopping offers online, consequently minimizing your expenses. It would be great if that were true, but usually adware applications do not live up to their promises. Since you cannot download Olacarita at the official website directly, we can assume that this program gets distributed bundled with freeware apps via third-party websites. At the same time, there is a high chance that Olacarita is not the only potentially unwanted application on your computer. It also means that you install this program yourself, and most of the time it is possible to avoid setting up such adware apps on the system. All you have to do is be more attentive during freeware installation. The biggest security concern related to Olacarita is third-party content. Needless to say, this application does not review the links that get embedded into its ads. Also, it does not check what websites they lead to. Therefore, if you click Olacarita ads, you might land on a dangerous website that collects your data or even exposes you to malware distribution network. To prevent that, you have to delete Olacarita right now. It may not be possible to delete all the registry entries and adware-related files from your computer manually. Thus, when you are done uninstalling Olacarita via Control Panel, please scan your computer with SpyHunter free scanner. This way you will determine what other files and programs must be taken care of. To ensure your system’s security, invest in a licensed antispyware tool. Go to Settings on Charm bar and select Control Panel. Open Uninstall a program and remove Olacarita. Select Uninstall a program and remove Olacarita. 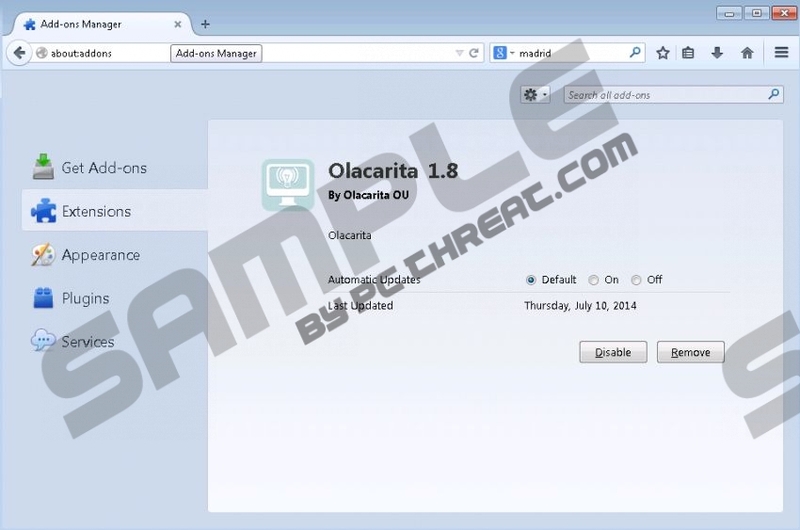 Double-click Add or remove programs and uninstall Olacarita. Remove Olacarita from the list. Press Ctrl+Shift+A for Add-ons manager tab to open. Disable and remove Olacarita from Extensions. Quick & tested solution for Olacarita removal.